Berry salsa bursts with colour and flavour – it’s quick to stir together and delicious served over grilled chicken or fish, or served with tortilla chips. 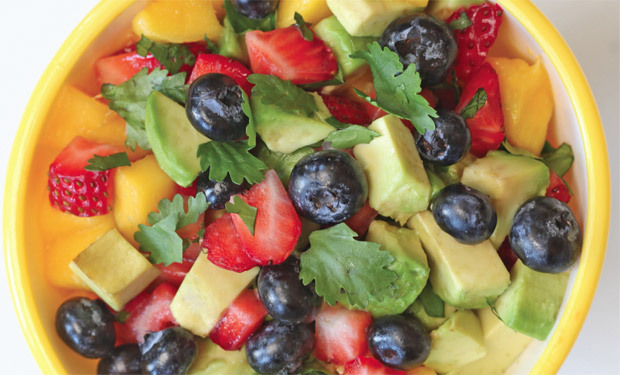 In a medium bowl, gently combine the berries, mango, avocado fresh mint or cilantro, lime juice and honey, tossing to coat. Serve immediately or refrigerate until needed. Makes about 3 cups. 56 calories, 1.7 g fat (0.3 g saturated fat, 1.2 g monounsaturated fat, 0.3 g polyunsaturated fat), 0 mg cholesterol, 10.6 g carbohydrate, 0.7 g protein, 2 g fibre.